HOAInTouch.com Product Blog: Invite a Neighbor! We had (another) small release last night in which we pushed out a new feature to the marketing site. 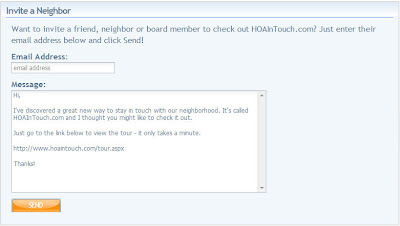 You can now easily invite a friend, neighbor or board member to take a look at HOAInTouch.com. Just click on the new Invite a Neighbor tab, enter their email address and click the Send button. Super simple. If desired you can also customize the message by modifying the text in the Message box. This would also be a great way to invite your neighbors to sign up for HOAInTouch.com if your community is already setup! Hope you find Invite a Neighbor useful! Thanks for stopping by and we will see you ‘round the neighborhood!